A few days in Montpellier are enough to run through its beautiful sights, monuments and museums. It's rumored to be tremendously pleasant in the summer during the Estivales (a festival consisting of wine tasting and concerts), but it's not too bad in the winter either. After a week, it's likely that you'll start finding your way around the city's maze of medieval streets, corners and dark alleys included. And then, you might spot the first one. A small and colorful mosaic of some sort of pixel creature, a space invader? 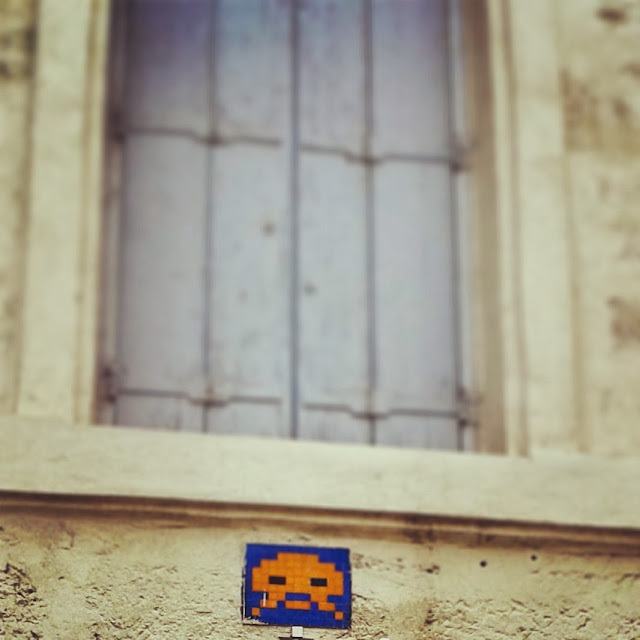 In any case, a unabashedly anachronistic decoration on Montpellier's old white walls. I smiled at the first one, but as more of them appeared right before my eyes on the walls of the city, I started taking pictures of them. And after I'd seen and photographed a few of them, I finally resorted to Google them and figure out what was going on. 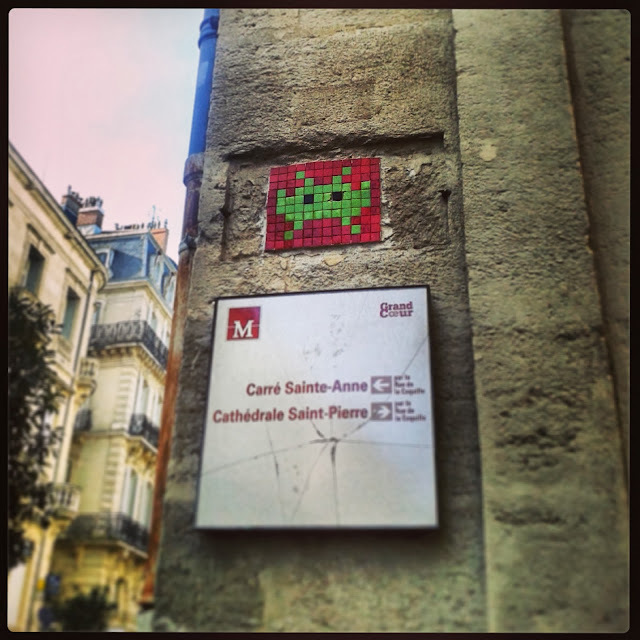 The space invader mosaics in Montpellier were placed by a French artist appropriately named Invader, who has made it his urban artistic mission to splash cities all over France and the world with his mosaics. In fact, the invaders can be found in cities throughout Europe, in North and South America, Asia and Oceania. The whole project is carefully planned out; the choice for locations and characters is all but random. The mosaics are strategically placed on visible places or in highly transited streets. 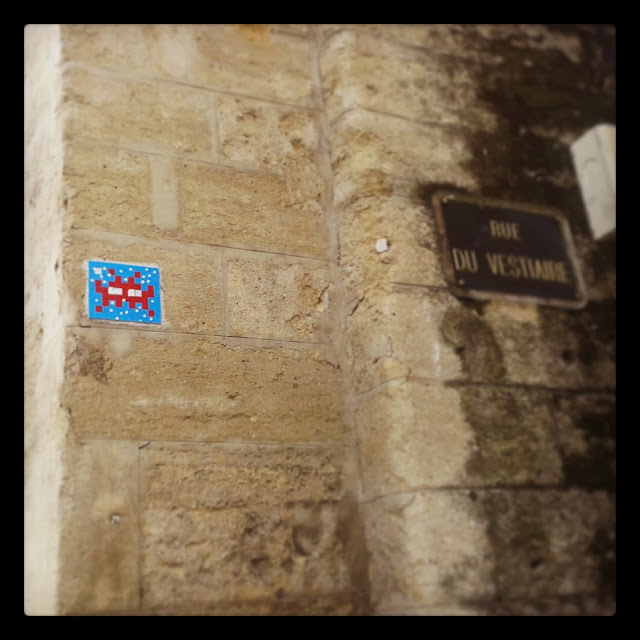 It's even cooler in Montpellier, where the mosaics are placed as to form a gigantic space invader when seen on the city map. As for the invaders themselves, there are no two identical mosaic creatures. Their designs are based on characters from Space Invaders, one of the first widely available videogames. In other words, a technological fossil symbolizing the modern world which surrounds us. It's not just that. Invader justifies his choice by saying that they represent exactly what he is doing is exactly that: invading spaces.